Today's engineered wall system delivers decades of solid performance. The craftsmanship of a home's foundation will forever define the integrity of the structure. The same is true of any siding project. To ensure a quality siding installation, there is no substitute for a true foundation. By using ThermoWall, Suburban Construction's exclusive wall system, lasting efficiency and value will be added to your home. You will have maintenance free exterior that will maintain its new appearance for a lifetime! ThermoWall by Suburban Construction, contour-supporting foundation provides sold protection from wind, hail and other impact that would damage conventional vinyl siding. Manufacturer's tests show that our contoured underlayment system increases the impact resistance of our siding by OVER 300%! Its snug, secure foundation will protect your siding investment for as long as your home is standing - GUARANTEED! Our ThermoWall System offers up to FOUR times the insulation value of the most commonly used substitutes! ThermoWall significantly reduces drafts and air infiltration without trapping harmful water vapor. With this type of insulation value, imagine the energy savings ThermoWall will pay for itself time and time again! If you are like most people, your home is the single most important investment you will ever make. 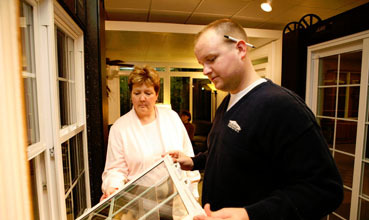 The home improvement decisions you make today will be with you for a long time. So, do the job right the first time and make it the last time! The fullback insulation systems will both transform your home's appearance and deliver lasting performance. If you're going to do it, do it right. Make it ThermoWall from Suburban Construction INC. Please enter the number 52699 in the box provided below.